I was in a mood to fix a quick Sunday breakfast for the kids, as I had to start shopping for FIL’s 80th b’day which I have to attend this month end in Bangalore. Last few days were very low for us and since the younger one seemed a little okay, and he had got the kind little nod from the doc, that he could have some whole wheat pasta made in little oil, I indulged myself in making some dinosaur shaped pasta for him. A treat for him after 3 weeks of stringent diet regime. This is a very simple recipe, very quick to make and a complete heart winner with the kids. One can use any pasta of their choice, I used the dinosaur shaped ones as my younger one is very fond of it. I used fresh herbs, no artificial flavorings, a little olive oil and spiced with a little freshly ground pepper. We got a pasta with all natural and prominent flavors. Take a large pan and take enough and more water to boil the pasta. One should remember that Pasta almost doubles in volume after cooking. Add 2 tsp oil and some salt to the water. When the water starts boiling add about 11/2 cups of pasta and cook ‘Al Dente’. It means it is tender but with firm resistance to the bite. Once cooked remove in a colander and pour cold water on it and keep aside. This prevents the Pasta from sticking each other. Heat olive oil in a pan and add chopped garlic. When it turns brown add the onions and cook till translucent. Now add chopped celery, carom seeds (I added this as they are good for gastric discomfort), carrot, tomatoes, salt and sugar. Cook till tomatoes are done and has a saucy texture. Now add the pasta, capsicum, pepper pwd and toss it in the sauce properly for 2-3 mins max. Do not overcook, else you loose all natural flavors and the sauce turns too thick. It should coat the pasta properly (ideally the pasta should be dipped in hot water before adding to the sauce). Serve it hot with some parsley and grated cheese (I did not add that, as he still can’t have it). Sending the pasta to Kids delight hosted by Srivalli at Spice Your Life to celebrate her blog’s first anniversary. 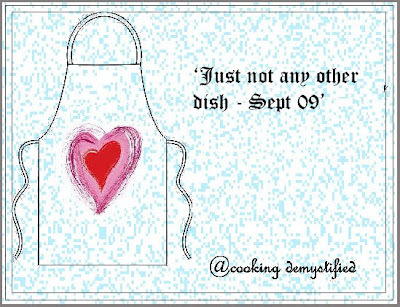 And to “Just not any other dish” hosted by My experiments with cooking @ cooking demystified, as this is a special meal for my child, for whom it is like the first step taken towards normal eating after a very long duration. So, this Pasta is very special for him and for me too. Hope the little one is all fine now. When kids are unwell, nothing seems right! The pasta should have cheered him up. Looks real good. Hey hope the kiddos doing good now.. I know when my lil niece gets sick.. i get tensed.. all the time..
the pasta seems yummy.. hey id eat something like that myself.. I'm sure your son must have enjoyed his colorful great looking pasta,who wouldnt. Wow pasta looks yummy..prefect entry Pari! Never came across these shapes...Where do you get them?Beautiful pasta, Pari! Looks good with lovely colors. Hi! I was gifted this Pasta by my co sister, she got it from Australia. But you get this shape in the cook and eat in 10 min variety also. I fail to recollect the name of the brand. Will write to you once I remember. Nice pasta dish for kids and adults Pari. Never heard of dino shaped pasta but can imagine why your little one would want it. Now, only if my little one would try that. Pasta looks colourful, lovely and slurpilicious! Kiddos will surely like it! oh i never attempted my own masala for pasta. always i bought the readymade storebought pasta sauce. Ur version looks very simple and superbWill try soon for kids.Thanks for sharing this recipe. Wow yummy pasta!! Those little dinos are really cute. Perfect entry for the events! That a nice dish..thanks for the entry! the name is so catchy..am sure its a great dish . The dinosaur pasta looks like fun for all ages, grins. I think seeing this wonderful pasta helped to perk him up! It looks delicious and I love the dinosaur shapes! So funny! Kids will love!